Character. Cost: 6. STR: 6. 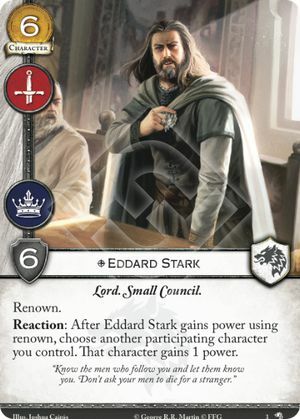 Reaction: After Eddard Stark gains power using renown, choose another participating character you control. That character gains 1 power. "Know the men who follow you and let them know you. Don't ask your men to die for a stranger." Wolves of the North #3. The Eddard that was promised. The US Nationals’ winning deck had 3x. The Worlds’ winning deck had 3x. There is a reason he is called Fast Eddy. He helps you faster than any other character. For his 6-cost, 6-STR, Lord, non-loyal in every Banner of the Wolf, massive power gains—how you win the game—he takes my number 1 spot of 2016.